Researchers at the RIKEN Center for Sustainable Resource Science (CSRS) have discovered a hormone-like peptide in plants that helps increase their tolerance to excessive salt. Published in the Proceedings of the National Academy of Sciences USA, the study found several genes that can increase salinity tolerance, the most effective being a small gene that codes for the peptide AT13. First author Kentaro Nakaminami notes, "We found the first functional evidence for improved salinity stress tolerance in plants in response to treatment with a small peptide. This is a first step towards the production of new agricultural supplements for plants growing in high salinity conditions." Just like animals, plants are affected by physical stress that can stunt growth and affect survival. For example, when soil is too salty, it draws water out from the plants. Excessive amounts of sodium are also absorbed by the plants, which can have toxic effects. The result is that important crops can have very low yields. Also just like animals, plants have automatic defenses against physical stress that involve peptide hormones, although we do not yet know much about them. Because peptides are basically very small proteins, the team at RIKEN CSRS began looking for peptide hormones related to salinity tolerance by first using a microarray analysis to find small coding genes that were expressed more under high salinity conditions. After finding several candidates, they created transgenic plant lines that each overexpressed one of the genes and then measured how well they fared in a salinity stress test. They found that four of these plants showed better tolerance than control plants, and chose to further investigate the gene that induced the greatest tolerance, AT13. Experiments showed that levels of the AT13 peptide naturally increased when plants were subjected to salt stress. The team then went further and determined the exact portion of the peptide that was important. 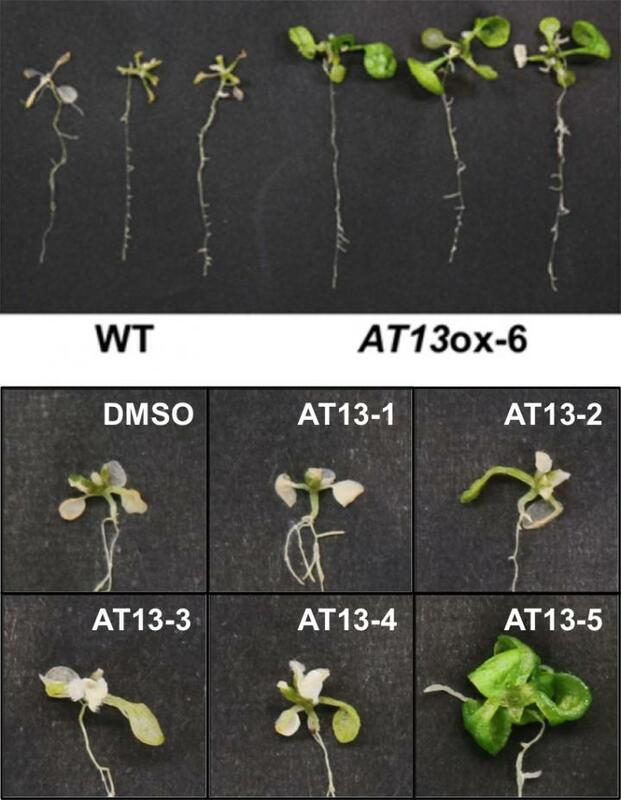 To do so, they synthetically made pieces of the AtPep3 peptide, and found that treating plants with one section in particular (AT13-5) was just as effective in boosting tolerance as transgenic overexpression of the gene. This method has key benefits. "Peptides are natural compounds that are safer than genetically modified plants," says Nakaminami. "Additionally, potential supplements made from synthetic peptide fragments will be easy to apply to different species of plants." Understanding exactly what the AT13-5 peptide fragment does to increase salinity tolerance was the next step. Experiments showed that the peptide did not affect how much water the plants lost. This means that it likely helps plants combat the excess sodium that accumulates inside the plants. Small coding genes in plants are numerous but have not yet been well documented or researched. Hanada is hopeful that many more peptide hormones in plants will soon be discovered. "We think that plants have many peptide hormones associated with physiological roles," he says. "We strongly believe that analysis of small coding genes or peptide hormones may provide new targets for understanding plant biology and improving crop yields in environmentally stressful conditions."